For her exhibition Out of Hand at Laure Genillard Gallery, Lisa Milroy explores the interplay between the framed and unframed, the actual and imagined, the object in the world and the object depicted – all ways to approach still life painting. This selection of paintings focuses on Milroy’s interest in pattern: rhythmic pattern in composition, and applied pattern as a pictorial characteristic of several of her painting motifs since the early 1980s, including items of clothing, examples of wallpaper and textiles, and the decoration of ceramics and everyday objects. Pattern informs a group of 3-dimensional paintings exhibited here, the ‘Weaving Paintings’ and ‘Reversibles’. 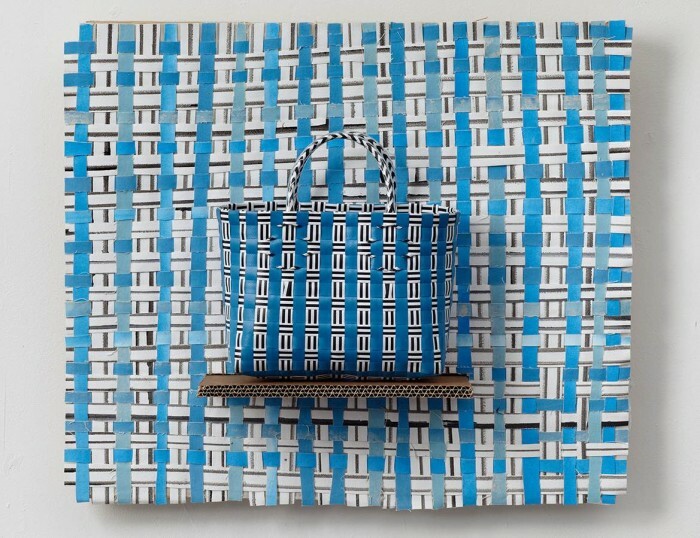 Pattern also underpins Milroy’s design of functional objects, including her silk scarves for Slade Editions in 2014 and her Lisa Milroy fashion range launched in June 2015, featuring six hand-painted dresses. Out of Hand investigates the tension between the eye held by pattern and the mind stirred by metonymy. It addresses painting in terms of time and space as much as surface. The exhibition highlights the importance of the body in tandem with the mind in the experience of making and looking at paintings; and the physical and emotional sense of touch. Still life is at the heart of Milroy’s practice: in the 1980s her paintings featured ordinary objects depicted against an off-white ground. Subsequently her imagery expanded to depictions of objects within settings, and landscape, architecture and people. As her approaches to still life diversified, so did her manner of painting, giving rise to a range of stylistic strategies. Throughout her practice, Milroy has been fascinated by the relation between stillness and movement, and the nature of making and looking at painting. Milroy was elected to the Royal Academy of Arts in 2005 and is currently Head of Graduate Painting at the Slade School of Fine Art, UCL. Milroy won First Prize in the John Moores Painting Prize in 1988. She is an Artist Trustee of Tate and a Liaison Trustee to the National Gallery. Her work is held in many public and private collections. Recent solo exhibitions include Social Fabric, Oriel Sycharth Gallery, Wrexham; Hands On, Drawing Room, London; Party of One, Crate, Margate. Group exhibitions include Seeing Round Corners, Turner Contemporary, Margate; Grosse Geister, Artist Room: Lisa Milroy, Kunstmuseum Bonn; Mémoires Croisées/ Dérives Archivisitiques, Galerie Colbert, Paris; Present Tense, Swindon Museum & Art Gallery; Painting in Time, The Tetley, Leeds; At Home, Yorkshire Sculpture Park, Wakefield; I Cheer a Dead Man's Sweetheart, De La Warr Pavilion, Bexhill on Sea.